Glaro’s Satin Aluminum (SA) finish. A Satin Aluminum finish starts with a hand spun receptacle top and a hand crafted body made from aluminum sheeting. Each part through multiple steps is polished at a very high speed to change the surface to a super fine grain satin finish innovated and perfected by Glaro over many years. A very durable clear baked powder coating is applied to help preserve the finish and process. The result is a satin aluminum waste receptacle that stands out from the pack aesthetically and leads its category in durability. Satin Aluminum receptacles have a beautiful, lustrous, bright, and sleek appearance that lasts indefinitely. They don an upscale finish, and they display a classier, more architecturally modern look perfect for any décor that is a perfect choice for average as well as high end facilities. Their all metal construction is fireproof, weather proof, and ideal for salt air moist environments. The clear coatings resist burns, scratches, and wear marks. 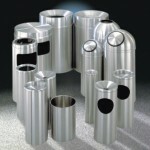 Aluminum waste receptacles can last a lifetime. Glaro Incorporated’s aluminum waste receptacles are 100% post-consumer recyclable and they are made from 30% recycled aluminum. Combining their Green materials with their durability makes them some of the toughest, eco-friendly metal waste receptacles on the market. Satin finishes on Aluminum Receptacles have many advantages. They retain a bright appearance indefinitely and they clean easily with a damp cloth without streaking. No expensive abrasives or chemicals harmful to the environment are necessary to clean them. Many receptacles on the market will rust, wear, tarnish, and corrode quickly if placed outdoors. Because aluminum cannot rust, it is the ideal material for using outdoors and indoors and is therefore an excellent choice over stainless steel which easily shows streaking, water marks, and dirt and may develop a light coating of rust if it is a lower grade alloy. In sum, the combination of using aluminum with a satin finish is almost impossible to surpass if appearance, durability, environmental sustainability, maintenance, and indoor/outdoor readiness are important to you in a waste receptacle. Here is a link to Glaro’s collection of color finishes.